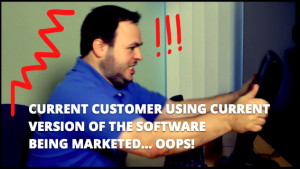 Video Marketing 101: Don’t Insult Your Customer | Rewatchable, Inc.
From the makers of the apparently awful and misery-inducing screen capture software Camtasia Studio 7 comes the absolute worst corporate video in the history of corporate videos. See what a jerk this guy is? He’s a paying customer using THE CURRENT VERSION OF OUR SOFTWARE!!! Don’t worry, we’re about to release some new software that will cure him of being a miserable, horrible loser. It’s not out yet. But it will be. And then, once he gives us more money, he won’t be such a loser. Until Camtasia Studio 9 comes out. Then all bets are off and they’ll probably both be a couple of screwhead jerks. Hey, at least Techsmith disabled (forgot to enable?) embedding. Bright side. All joking aside, this was probably conceived and executed by some well intentioned Techsmith employees with a ton of excitement and affinity for Camtasia Studio 8. They probably felt that the new and improved feature set was so amazing that you’d have to be crazy not to upgrade, and that this video would be a great way to illustrate how awesome life will be for screencast producers once Camtasia Studio 8 releases, even for Camtasia Studio 7 users. The problem is, customers are a precious commodity, cost money to acquire, cost money to keep, and generally like you only as well as they feel about the quality of and support for your product. They were kind enough to pay you money, and in order to preserve and grow that relationship, you must never disrespect or insult them. Customers who use older versions of your product ‘appreciate a classic’. They ‘have a great tool that works just right for them’. Maybe they’re ‘using a subset of features and wouldn’t benefit from the new features’. Regardless, they are still your customers, and insulting them will cost you the precious opportunity to speak with them on friendly terms again in the future. Don’t make the mistake Techsmith made with this video. All of your customers are winners, and should always be portrayed as such in any corporate video. You can be funny, you can play with them, but if you’re not 100% sure on the tone and messaging, err on the side of caution. And Techsmith? We still love Camtasia, even if you called us losers who have to stay late at the office to get our work done. First of all, thanks for loving Camtasia! I apologize that you felt we were saying Camtasia Studio 7 was terrible. On the contrary, with millions of users worldwide, we know Camtasia Studio is great software. However, as video continues to be a commonplace form of communication, the technology used to build previous versions of Camtasia Studio just didn’t provide the performance and user experience we know our customers need. The improvements coming in Camtasia Studio 8 make all of us at TechSmith confident that our users should give the new version a try. What was great software before is now downright amazing (or at least we think so). We can’t wait to get your feedback on the new release! If you’d like to be a part of the sneak peek blogger group, please drop me an email. Natalie, thanks for reaching out (we do use and love Camtasia both on the Mac and Windows), but do you see the problem with the video? The key takeaways are that Camtasia Studio 8 has terrific new features (good) and that Camtasia Studio 7 users are frustrated by your product, don’t get to go to fun work parties, and can’t complete their screencast work in a reasonable amount of time (not good). By using your current version of your own product as the ‘bad guy’, you’re creating a trust issue with future purchasers too, because what’s to say that a year or two down the road THEY’RE not missing work parties and shaking their monitors when Camtasia Studio 9 rolls out? Beating up on your current version is a common but critical mistake with marketing upgrades. If you like the video otherwise (I think it’s a fun idea and the technical execution is solid), it’s a pretty easy fix. Re-record the narration to make the monitor shaker a user of ‘the other guys’ screencast software. Maybe Captivate? Are they the biggest competitor in your market? Then that poor fella’s a leper because he chose Adobe instead of Techsmith, not because he’s using your current software.